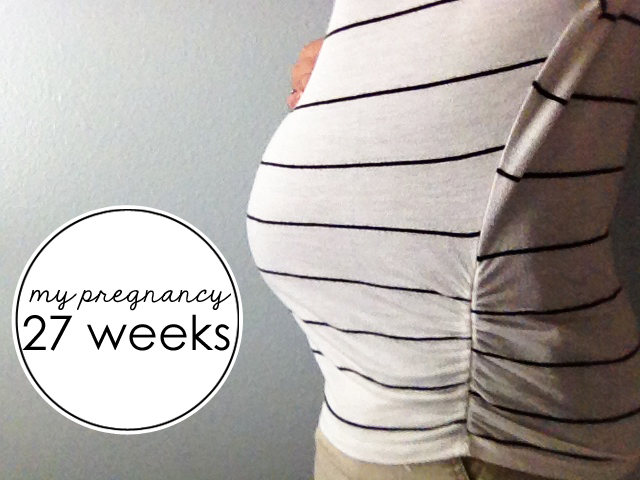 I noticed I hadn't done a belly update in a while, 7 weeks ago to be exact when I was 20 weeks preggo. -Maternity clothes? Yes I have to wear maternity clothes, nothing else fits! I love my maternity leggings! -Stretch marks? No stretch marks! yay! -Sleep: I'm sleeping ok, I get up to pee 2-3 times a night still but that doesn't bother me much, what does are the leg cramps! Goodness! -Best moment this week: Sewing burp cloths for baby Levi! I want to make more! -Food cravings: Nothing much, just salad from Jason's Deli oh and mexican food! -Anything making you queasy or sick: Nope, so thankful the nausea has been gone for a while now! -Labor Signs: I think I was getting some braxton hicks last week but they weren't too bad! -Mood: I have been having some mood swings, last week everything made me cry and this week everything frustrates me! LOL Overall I feel happy though! Just ready to meet Baby Levi! -Looking forward to: My baby shower in a couple weeks! I love the side by side pictures of the belly! So excited for you!! Thanks Jacqui! I'm excited too! Hope you can come to my baby shower! SOOOO cute!!! My belly button has alllllmost popped out - EEK!! You look great, and I LOVE your pictures. Are you using a tripod? ?